The new Salt 10000 is the big brother to the Salt 7500. 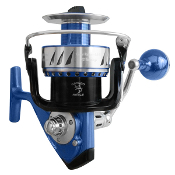 It's been designed for longer casts, holds more line and has ZZ bearings for high speed runs. It's packed with power for handling the biggest fish.